← Mother Of All Food Truck Rodeos This Sunday in Durham! 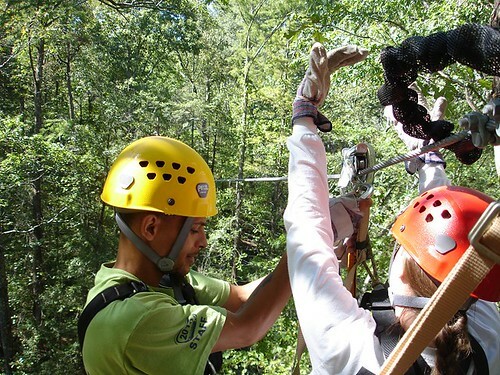 ZipQuest ~ Ziplining through the forest in Fayetteville! The ZipQuest facility is located in a rural part of Fayetteville that is only about a hour and fifteen minute drive from North Raleigh. When we went last year the cost was around $80 a person for a tour that takes about 2-2.5 hours with 8 different ziplines through the forest. The current living social deal is $85 for two people so it is a pretty darn good deal. When we went we were put with a group of 6 other people and had two great tour guides working with us on the tour. The spend the first 10-15 minutes helping everyone gear up and going over the equipment. 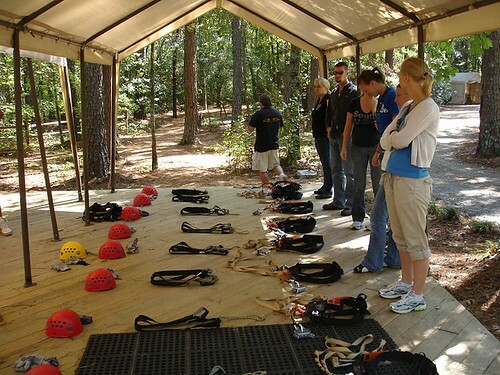 Then they take you over to a small training zipling that is just 4 feet off the ground to teach everybody how balance on the zipline and how to safely stop yourself. The instructors take care of actually attaching your equipment to all the ziplines so you don’t have to worry about that part at all which is nice. 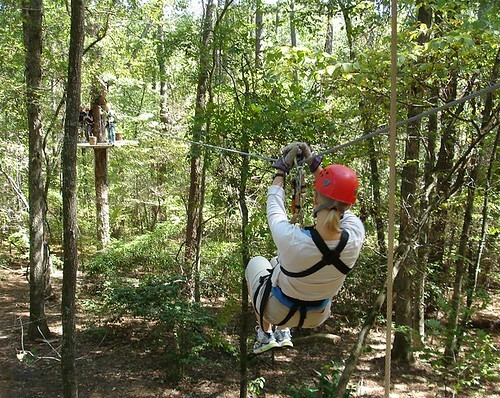 All the ziplines are attached to small platforms up in the trees throughout the forest. 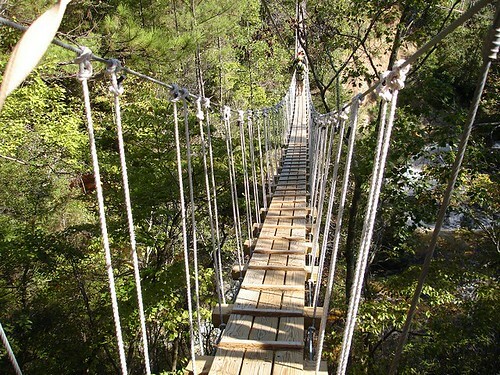 Once you go up to the first line, you will spend the entire time up in the trees using ziplines and suspension bridges to travel from tree platform to tree platform. Some are just short zips while the others are much longer, the longest zip is around 800 feet. 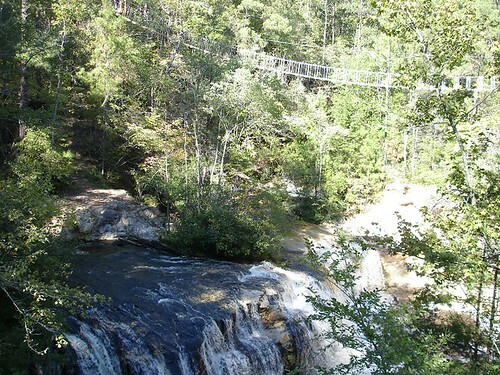 The tour is very scenic with views high in the tree tops from sixteen different tree platforms and a three different suspension bridges with one that goes over Carver Falls. Needless to say there are lots of great photo opportunities. You are allowed to bring a camera, but you need to be carfeul that you don’t drop it along the way. 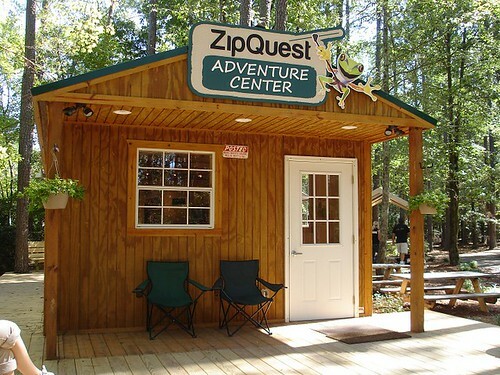 I highly recommend checking ZipQuest out if you are looking for something different to do on a nice fall weekend. It is a gret family day out, but if you plan to take your kids along just remember that according to their website they must be at least 10 years old to zip and must weigh between 70 and 260 lbs. For more information check out their website or follow them on facebook.